This post originally appeard on HubSpot's Marketing Blog. The top of the funnel, where the focus is on traffic. The middle of the funnel, where the focus is on lead conversion. The bottom of the funnel, where the focus is on sales and revenue. The benefit of tracking your go-to-market efforts in such a manner is that you can diagnose problems often before they have a negative impact on your revenue results. From this perspective, there are only eight scenarios that you could be facing. Each scenario has its own set of opportunities and dangers. By identifying which scenario applies to you, you can then initiate specific actions with confidence. When measuring these conditions, it’s important to note that strong or weak are relative terms. The goal behind this effort is to build a structural approach to growth. It’s not about just making a sale today, or even growing this year. It’s about being able to do so predictably, sustainably and scalably. If you don’t have clear targets for traffic, conversion and sales, you’ll need to develop them before you can make an assessment. For help, you can review our recent post on The 9 Metrics You Must Be Tracking to Scale B2B Sales or use our lead generation calculator. This is the condition that everyone strives for. Your top, middle and bottom of the funnel are all dialed in producing the results you need to maintain your growth rate. When you find yourself here, your primary job is to develop the early warning systems to alert you to a changing condition (oh yeah, and don’t forget to celebrate a little). In this scenario, you’re generating an adequate number of leads, and you’re meeting your sales targets; but you’re not driving new visits to your site and the top of your funnel is weak. The danger here is that maintaining (let alone accelerating) your growth rate will be very difficult. 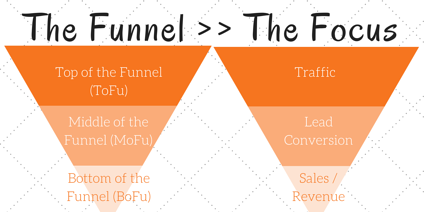 Put more focus on the top of the funnel. You can do this by increasing the rate at which you are creating new content (like blogs), by ensuring your website is properly optimized or by encouraging your entire customer facing team to share your content through the appropriate channels. Identify potential “kindred spirits.” These are people or organizations who share a viewpoint with you, provide complementary products/services and communicate with the same target market. Engage with these people and empower them to share your message. Consider implementing a lead introductory campaign to entice targeted prospects to visit your site. It’s important to note that the focus of your campaign should be educational. If you get too salesy your efforts will backfire. This is a very common condition among mid-market companies and among companies that have engaged in SEO and pay-per-click (PPC) efforts. They’re driving plenty of traffic to their website, but they’re not converting that traffic into leads. Despite that, the company is still able to meet its sales goals. The fundamental problem here is that far too much of the weight for making sales is falling on the sales side of the organization. While marketing may be actively involved, creating awareness and driving traffic, those actions aren’t leading prospects to act. The content is not resonating with prospects. The traffic is low quality, and is not attracting the right type of people. The site is not designed to support the buyer’s journey and lead conversion. First and foremost, review your buyer personas (you have developed your buyer personas, haven’t you?) and confirm that a) the personas are accurate, and b) the content you’re creating resonates with what matters to them. Map your prospect’s journey, paying particular attention to the Epiphany Awareness and Consideration phases. Do you have the right message and are you creating the right content for each phase of the journey? If your website and marketing materials are filled with “we-do’s,” it’s a pretty good bet you’re not going to see a good conversion rate. It may be time for a website refresh or redesign. If your website isn’t built to directly support lead generation and lead management, it won’t convert. On several occasions, we’ve worked with companies who were getting plenty of traffic but little to no conversion. Within a couple weeks of a new website launch, we’ve seen conversion rates jump from under .5% to over 3%. In this scenario, it appears that you have a strong marketing process and a weak sales process. I see this on a fairly consistent basis with companies that implement an inbound marketing or other lead generation approach. Because you’re focusing on the top of the funnel and you’re generating conversion opportunities, you’re seeing your lead velocity grow; but it’s not translating to sales. This can be the most frustrating point in the journey of generating predictable growth. You’re doing the right things by focusing on lead generation, but you’re frustrated because it’s not translating to real opportunities or sales. Use a lead triage process to assess the quality of the leads you are generating. If you find that you’re not creating an adequate number of quality leads, then you’ve got a conversion problem. To solve that problem, refer to the Stong/Weak/Strong scenario above. If you’re generating enough quality leads, look next to your sales development approach. Your prospects aren’t waking up every morning asking themselves, “What can I do to buy something from ABC Company today?” Regardless of how clear you think it is that a lead should know to reach out to you to discuss how you can help them solve their problems, they’re most likely not going to. You need to have an effective process to follow up with those leads and to turn them into sales opportunities. Lastly, be sure to develop effective lead nurturing processes to keep your leads engaged and to support them as they continue through their journey. As we move into the scenarios that have multiple weaknesses, I’m not going to restate the actions to take that I shared previously. The most important thing to remember when treating multiple weaknesses is to always start at the top. Your impulse will be to “solve for the bottom of the funnel.” While this can lead to short-term improvement, the reality is that you’re not going to actually solve anything. The most likely causes here are either ignoring the top of the funnel altogether or a lack of clarity into who you are trying to attract. Start by defining your buyer personas and then use your blog to consistently deliver content that is valuable to them. Take a look at your website and sales process. It’s likely that you’re message is not resonating with your prospects and is in need of retooling. When you’re finished adjusting your message, determine what prospecting strategies you want to implement. This happens when you create a very popular piece of content. The key here is to dig deeper and figure out why a conversion path is so effective. What’s driving the prospects behavior and what problem are they trying to solve? From there, find ways to recreate that type of content in other areas. We had a client experiencing this precise problem. One piece of content was particularly popular. It was responsible for about half of their conversions and the quality of the leads was very high. Using this piece of content, we built a series of follow up tools that brought prospects further down the funnel, leading to a free assessment. Additionally, we recreated the approach for other content pieces. The result was stronger sales and an expanding top of the funnel. This is where everyone starts. If you find yourself with this scenario, it’s a great time to implement an inbound marketing approach. Looking to get started on improving your conversion funnel? Download our calculator today to forecast exactly what you need to adjust to hit your growth goals.